This is a beautiful but chaotic collection of full-color paintings of Felix the Cat, by Don Oriolo. There are at least five title pages and subtitles, all different, plus a foreword by Craig Yoe and short essays or tributes by comic book and animation experts, historians and, in the book’s term, aficionados Mark Evanier, Jerry Beck, David Gerstein and Paul Castiglia. The most important subtitles are A collection of paintings from the prolific imagination of the Felix the Cat guy and Curated, designed and edited by Rod Ollerenshaw. Another is The Felix the Cat Paintings of Don Oriolo. To add to the confusion, there are websites and copyright statements for donoriolocollection.com, ollerenshawworkshop.com, © 2014 Felix the Cat Productions, Inc. and © 2014 Gussoni-Yoe Studio. Inc. Included are full-page photographs of Don Oriolo with Craig Yoe, two of the essayists, actor-artist Tony Curtis and some of his paintings. Foreword by Craig Yoe, San Diego, CA, IDW Publishing, February 2014, hardcover $34.99 (unpaged [168 pages]). Don Oriolo is the son of Joe Oriolo (1913-1985), the animator/cartoonist who took over Felix in 1956 and produced the “magic bag” Felix TV cartoons from 1958 into the early 1960s, plus the Felix newspaper comic strip and many comic books of the period, and bought the Felix rights outright in 1970. 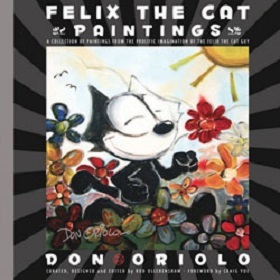 The multitalented Don Oriolo has spent his life keeping Felix the Cat alive after his father’s death thirty years ago, producing international theatrical and TV animation, writing songs, writing &/or drawing comic books, designing Felix video games, guitars, and merchandising items of all sorts – and always painting. For the record, Felix the Cat first appeared on November 9, 1919, in the silent theatrical animated cartoon "Feline Follies", produced by the NYC-based Pat Sullivan Studios for Paramount Pictures’ weekly Paramount Magazine feature. It was designed and animated by Sullivan’s lead animator, Otto Messmer. Felix (called Master Tom in his first two cartoons) was an immediate hit, appearing in monthly or semi-monthly animated cartoons from November 1919 through August 1928. In 1924, Sullivan animator Bill Nolan redesigned Felix to give him his classic look. There is a dispute over whether Sullivan or Messmer created Felix. Sullivan claimed that he did and assigned Messmer to develop the character, while Messmer claimed that it was his creation that Sullivan only approved. What is known is that Sullivan never publicly gave anyone besides himself any credit, and during the height of Felix’s popularity in the mid-1920s, Sullivan went on lengthy world cruises lasting months, still taking credit for personally drawing and animating every cartoon and newspaper comic strip produced by his studio. Sullivan was a cartoonist and could draw Felix, often dashing off quick sketches on napkins or envelopes for his fans. Felix the Cat Paintings gives credit to Otto Messmer and Joe Oriolo, but does not mention Pat Sullivan. Felix quickly lost popularity in 1928, due to the appearance of Walt Disney’s Mickey Mouse sound cartoons, combined with Sullivan’s reissue of old silent cartoons and refusal at first and later inept adaptation of sound. In 1932 Sullivan’s studio closed due to their failure and Sullivan’s acute alcoholism. He died in 1933. Sullivan’s estate in Australia (first his brother, and in the 1950s his nephew) took over ownership of the character, and marketed it mostly outside of animation until Joe Oriolo took it over on the nephew’s behalf in 1956. Oriolo further refined Felix’s design in 1958 for limited TV animation. This is primarily an art book. There are full-page close-up reproductions of 132 fine-art paintings, one per page, and a few photographs showing Don Oriolo with one of his paintings. For instance, “Don’s Felix painting hanging in a Starbucks in NYC”, showing Don posing next to a large painting of Felix drinking a non-Starbucks cup of coffee. There are Felix oil paintings, watercolors, marker art, gouache (probably), Prismacolor and other artistic media, on canvas or boards. The paintings show Felix in abstract art, children’s book illustration style, Cubism, Expressionism, Fauvism, pop-art, and Surrealism. Each painting is captioned, and some of the captions (”Cube Me In”, “Taking a Surrealistic Stroll in Miro Land”) specify their influences. All, even those showing Felix asleep or deep in thought, are lively and vibrant, exhibiting a mood of joy. This is a HAPPY book. If you are not already a Felix fan, you will want to go out and watch a Felix cartoon, though one of the old silent ones that were made for adults, rather than the newer color cartoons designed for children, I’m afraid. P.S. : At the June 2014 Licensing Expo in Las Vegas, DreamWorks Animation’s Jeffrey Katzenberg announced that studio’s acquisition of all Felix the Cat rights from Don Oriolo. Does that mean that Don Oriolo has to get DreamWorks' permission to make any more Felix paintings?